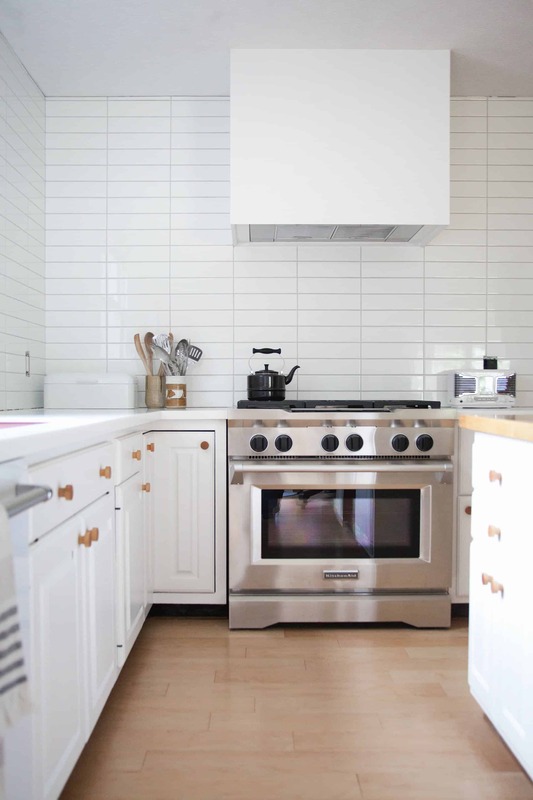 I’m so excited to begin sharing posts about my kitchen renovation! 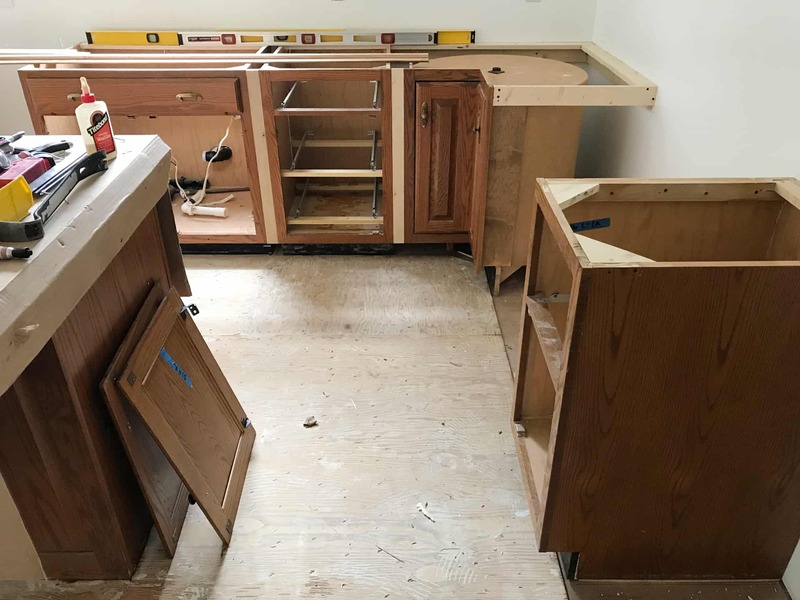 Remember the last time we fixed up our old kitchen? I can’t believe I’m doing it again three years later! I feel a little crazy, but super excited. The project is still in progress, but we’ve come a long way, baby! Our home was built in 1988, and came equipped with lots of dated brass fixtures and oodles of oak. Did I mention the arched raised paneled everything? 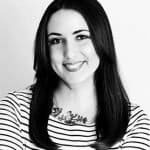 My husband Phil and I were able to turn a profit on our last home, which allowed us to pay off our student loans (woo hoo! ), have a down payment for our new house, as well as a reserve budget for immediate renovations. Since we were working with cash for this renovation, I wanted to be as careful with spending as possible. No going over budget allowed! I would have loved to equip our kitchen with brand new, custom-made cabinets to fit the new footprint I designed for this space, but a more budget-conscious choice was to reuse our existing oak cabinets, rearranging them to fit the footprint and using spacers between cabinets where necessary. And, of course, you knew I’d want to paint it all white! 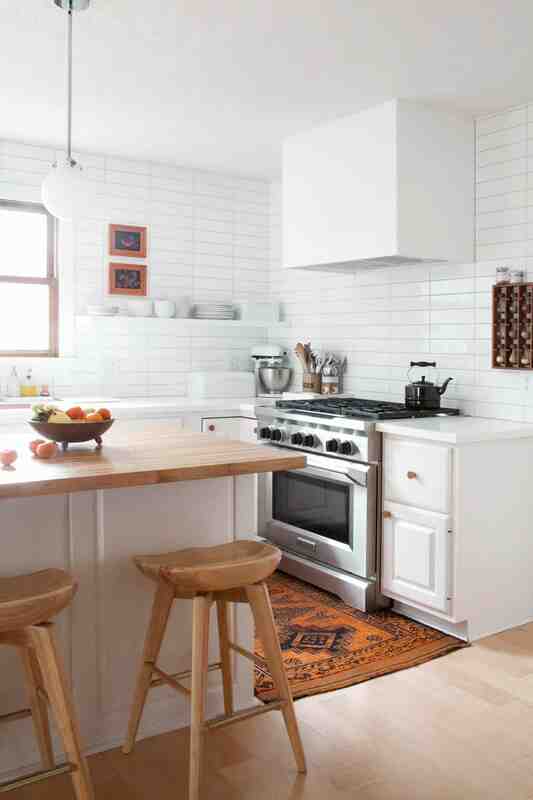 We seem to be crazy for white kitchens here at A Beautiful Mess. This is how our stove wall used to look before rearranging the cabinets to move the stove here, giving more space to the dining area of the kitchen. We discarded the old countertops and are relocating the upper cabinets to the basement and garage. Our new countertops are Corian solid surface in Arctic White, and we made the countertop of our kitchen island bigger so we can eat here too. 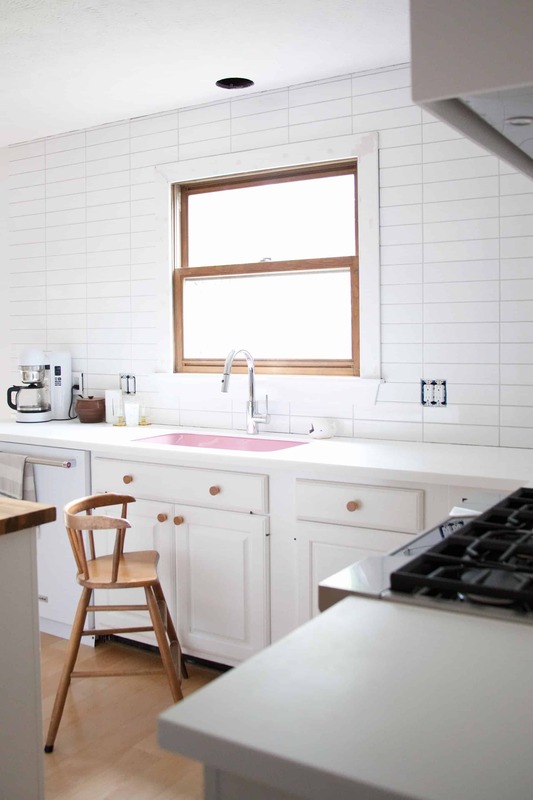 We outfitted it with the same countertop we had used in our last kitchen renovation—a maple butcher block slab from Lumber Liquidators we sealed with Waterlox, the same way as last time. Chalk paint is different from chalkboard paint. Chalk paint is a specially formulated flat paint that will stick to almost all surfaces without sanding or priming. It has a matte finish and needs to be sealed. 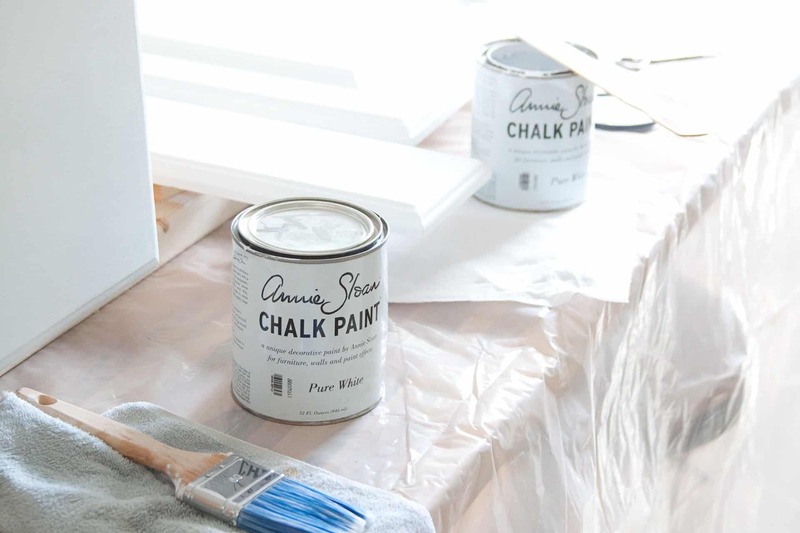 Other brands have formulated their own versions of chalk paint, but Annie Sloan is the original. I used their Pure White paint, and it really is a neutral white without warm or cool tones to it. First, I thought I should show you what our kitchen looked like when we first got the keys to the house. 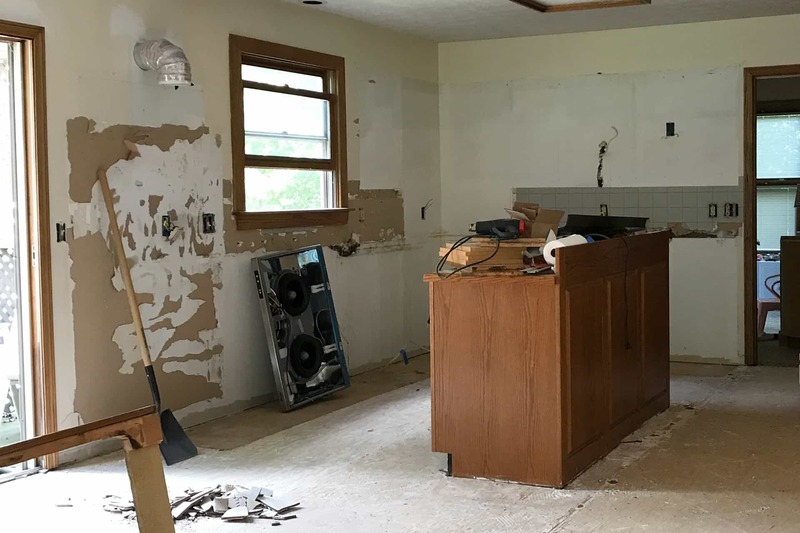 We completely removed all of the cabinetry on the right wall, and I’m working on building a shallow shelving system to go in their place, in order to make more room for seats at the island and around the dining area. We moved the stove to the far wall, to make more room in the eat-in area of the kitchen. This required running a new gas line to power the stove (the old stove was electric) as well as rerouting ventilation for the hood vent. First, we pulled everything out. I had rearranged all of the cabinetry digitally on AutoCAD first to make sure I could get the footprint I wanted without physically rearranging them in place. There was one spot we had to glue in wood spacers because I didn’t have a cabinet wide enough for the space and didn’t want to go through the trouble of fashioning a new (albeit useful) narrow cabinet to fill the gap. Next, I removed the hardware from the doors and drawers, and filled the holes where the drawer pulls and door knobs used to be, since we planned to use new ones with different attachment points. To fill the holes, I used Plastic Wood brand wood filler, which dries within 15 minutes. So you have to work quickly, but you’ll also be ready to sand it smooth without waiting for too long. 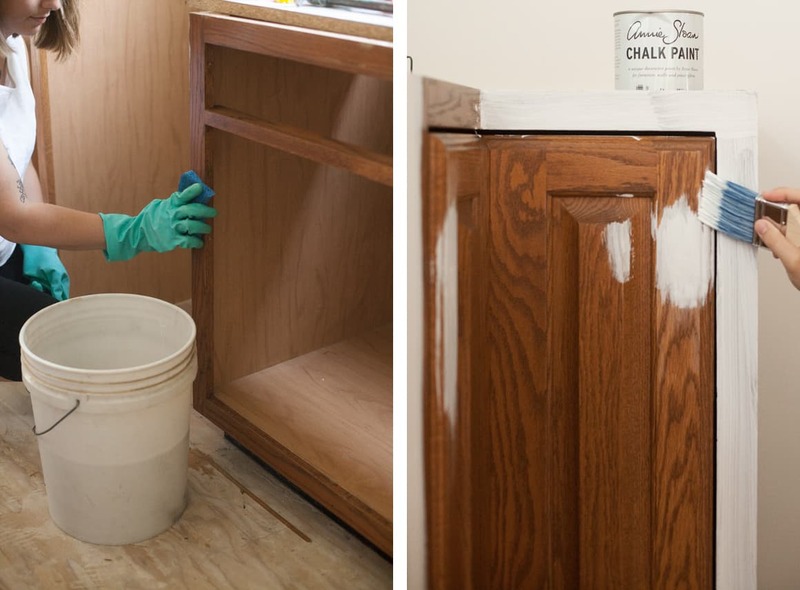 The most important step of painting your cabinets is cleaning them very well first. Use a degreasing detergent in your water and a non-scratch, yet abrasive pad (something you might use to clean a non-stick skillet), and really scrub hard! I thought I had cleaned my cabinets very well, but after painting, I noticed a few grease dots that were showing through the paint. I had to cover those areas with more than 10 coats of paint for the grease spots to stop finally showing through! Even primer wasn’t working to cover up the grease. So, please take it from me—make sure your cabinets are super clean before painting. After rinsing and drying the cabinets, I began painting with the chalk paint, without sanding or applying a primer. I was surprised at how thick the chalk paint went on, and how quickly it dried. I was able to paint a coat, and immediately begin another. It took three coats to cover everything, and while it his the oak grain, there was the texture of the brush left on the surface, so I lightly dry-sanded it with 600 grit wet/dry sandpaper. After the light sanding, the paint finish was so silky smooth—you’d never know there was oak underneath! Traditionally, chalk paint is finished with wax, but because kitchen cabinets receive such heavy wear, I wanted to use a finish that wouldn’t need maintenance. My go-to wood sealer is polyurethane, but it’s a finish that notoriously yellows. Not the look I want with white cabinets. So I used a water-based Polycrylic instead, which doesn’t use urethane as a hardener, so it won’t yellow over time. I brushed three coats of Polycrylic onto the cabinet bases, and sprayed three coats onto the doors and drawers. It took two 1/2 pints to cover the cabinet base and island, and three bottles to spray the doors and drawers. I used the original hinges on all of the doors, but replaced the hardware with these little wooden knobs that had a modern silhouette. They came unfinished, so I used Minwax’s natural stain and sealed with a few coats of polyurethane. I used polyurethane rather than Polycrylic, because it isn’t water-based and will stand up to being wiped and handles constantly, while I am a bit concerned about how Polycrylic may possibly become tacky after years of wiping and handling. Now that I’ve finished all of the painting, and because I’ve done it before a different way, I thought it would be really valuable to share a pros and cons list for each process—latex paint versus chalk paint. Chalk paint is thick and requires less coats of paint. There’s no need to prime. 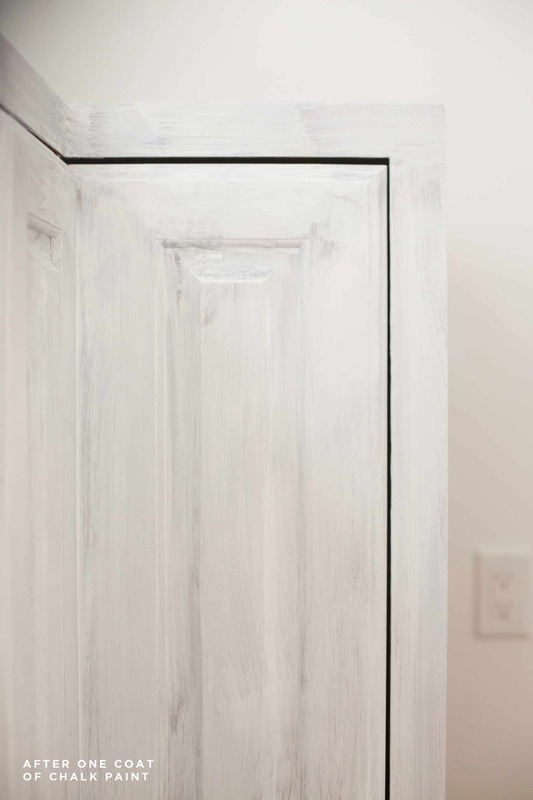 If painted over already sealed wood, tannins of the wood will not seep into the white paint, causing brownish stains. Chalk paint will hide heavily grained wood like oak. You can’t have custom colors mixed with Annie Sloan paint, though you are encouraged to mix them yourself. But this requires you to have extra on hand for touch-ups. It is hard to hide the tannins when painting over areas that have been freshly sanded and not sealed, like the areas around the hardware holes I filled. These areas required a few extra coats of paint, though primer may be more efficient at doing this. Because of the thickness of chalk paint, it can build up quickly and diminish the dimensionality of decorative routered edges. Chalk paint can’t be brushed on as evenly as latex paint can be sprayed on. Some edges of my doors and drawers have thicker coats of paint and almost globby areas, though I was careful not to put it on too thick. Latex paint is relatively inexpensive, and a little goes a long way when spraying. You can have your paint color custom mixed and if you need more paint mixed for touch-ups, you can purchase the exact color of paint again at a later time. You do not need to seal latex paint, and a satin or semi-gloss finish is easy to clean. Spray painting requires a lot of extra tools. Renting or buying them is expensive, and even if you own them, it is tedious to set up and clean up. Latex paint requires all cabinets to be sanding and primed. If done right, you will prime, wet sand, then prime again, which is very labor intensive. Sanding also requires more materials, therefore more expenses. If spray painting, you will need a large area to lay out all of your cabinets and shelves, and will have to protect a large area around your workspace because of overspray. If you are painting over raw wood (especially oak), you may have some trouble covering the tannins which cause brown staining in your finish paint. Chalk paint can be done over already sealed wood, which takes care of this problem. Latex paint is not great at hiding wood grain. You will need to do extensive priming and wet sanding first to accomplish this. Time: Both painting methods are time intensive. I had thought chalk paint would be faster, because it had less steps. No wet sanding after priming and then priming again to tough up after wet sanding. But brushing on chalk paint was time intensive, and I could never get it quite even, like you can with spraying. Spray painting latex paint was much faster, though it requires more coats, since you thin the paint before spraying, and spray it on lightly. Also, I think all the sanding I did for our last kitchen was much easier then it would’ve been this time, because those cabinet doors were flat, whereas these ones have routered raised panels that would have been tedious to sand. Paint chipping: I’ve had experiences so far with both types of paint chipping off if you are rough with it, such as knicking it with a sharp metal object. I don’t think the lack of primer contributes to this happening, because I have experienced this with the latex painted cabinets as well. Credits//Author and Photography: Mandi Johnson. Photos edited with A Color Story Desktop. I love that you’re sharing your renovation with us, step by step. The kitchen looks SO good after the paint. 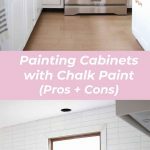 This is so helpful and the timing is perfect—I’ve been thinking more and more about painting our oak cabinets white. My one question is: if you were to do it again (heaven forbid! ), which method would you use? I’m not sure, to be honest! It’s difficult with raised panel cabinets to do sanding, so I suppose it depends on the cabinet type. But it was so easy to spray with latex and then I also didn’t have to do multiple coats of sealer over top at the end. 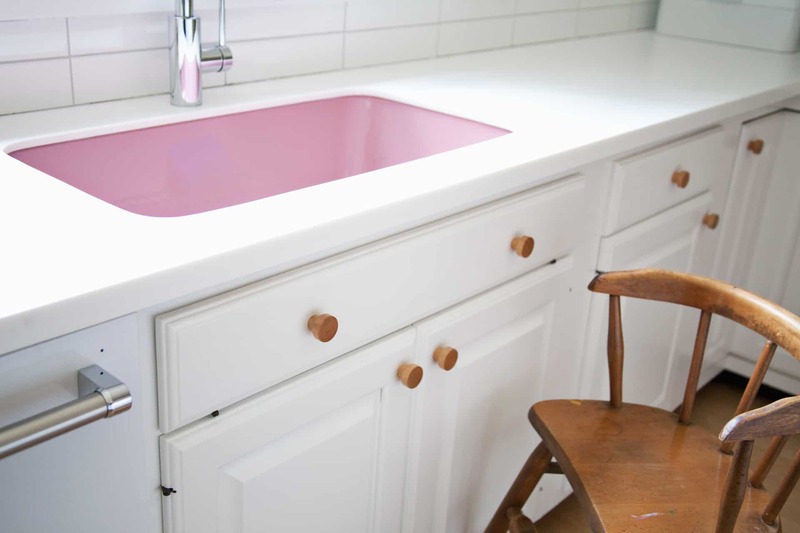 I had to comment just to say that I LOVE your pink sink! It’s such a great contrast to all the white and so fun! All the heart eyes! Thanks for sharing all the pros and cons. We painted the kitchen cabinets in our old kitchen using latex paint (no sprayer, just the old fashioned way!). Ours were 80s – or maybe 90s oak, too, and I was really happy with the updated look. It was a pain, however, with all the prep work, but much more affordable than installing new cabinets! I just love the spray urethane idea for a chalk painted finish were waxing might not be appropriate. I’ve been making my own chalk paint for years with just plaster of Paris, water and any color of paint I can buy at any paint store (you can find exact recipe on the internet). Pennies on the dollar compared to the price of Ann Sloan Chalk Paint and have had perfect results. Thanks for sharing all your ideas! What a transformation, the kitchen looks incredible! Way better than to buy a new one, and all you need is time and paint. Love it! The transformation is crazy! It looks awesome and so modern! I love it! FYI… you CAN spray chalk paint. You can also sponge it on! I’ll have to look into that! I know it would need to be drastically thinned down, but perhaps I’d use less of it in that case. I was going to mention that too. I’ve heard of others watering it down and spraying it with good results. I’ve only ever painted it with a brush though. I love what you’ve done with the space! Can’t wait to see what else you’ve done!! We painted our cabinets in our last house and it was the best thing we ever did! Have either paint technique proven to be more stain resistant? I’m considering using the chalk pain on stairs in my home as the paint that I originally used shows EVERYTHING and requires constant cleaning. You mean, you are having stains get into the finish of the paint and not come off? I’ve never had an issue with that using latex or sealing chalk paint with the polycrylic. I think the key is having enough paint on and a durable paint which can withstand scrubbing. I’ve scrubbed things to the point where they get dull, which leads me to believe I scrubbed past the top layers of shinier paint. Soooo… what I’m trying to say is, make sure to do enough coats of either latex paint or the sealer on top of chalk paint. I love the end result. Read your entire article. 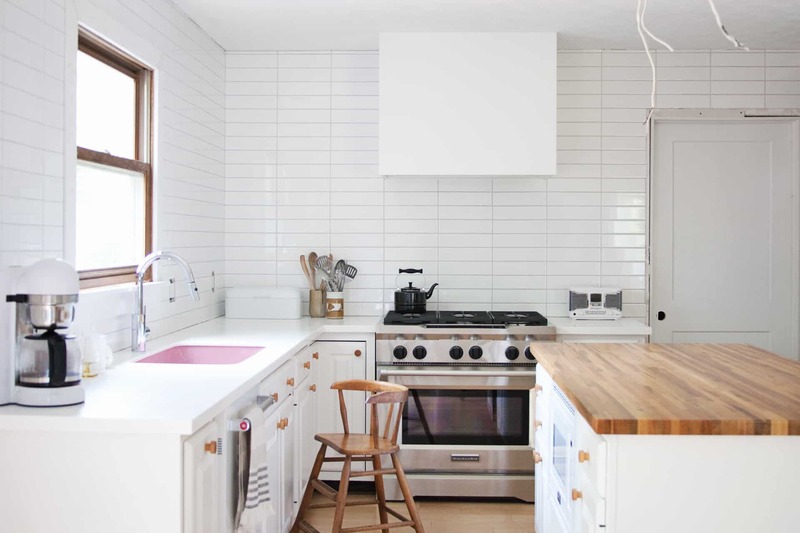 Very interesting as I’m also thinking about ways to save in renovating my kitchen. My cabinets are builders grade with formica-like finish on the surface. Therefore painting surface is not wood. I’ll replacing the doors but need to paint the rest of cabinets to match. Prefer creamy white. Any suggestions please ?? Do you mean suggestions for paint colors, or paint techniques? I’d definitely sand down the finish of the cabient base with a high grit sandpaper, and use a high quality primer. I am a chalk painting fiend. I’ve chalk painted and distressed an island in my kitchen, cabinets in my sewing room, book cases, furniture and even a counter top. I recommend using my Savvy Sister’s Chalk Paint Dust. It can be added to any flat latex paint, so the colors are limitless. My Savvy Sister also sells a spray gun (called a “Critter”) for about $40, which I use to get a very even coat without any globs or brush marks. I suspect that’s because the paint has the same viscosity as latex paint unlike the Annie Sloan product which is much thicker. For cabinets that are already installed, I do brush the frames and still have no brush mark issues. That’s easier than masking off the entire cabinet interior and spraying the frames. 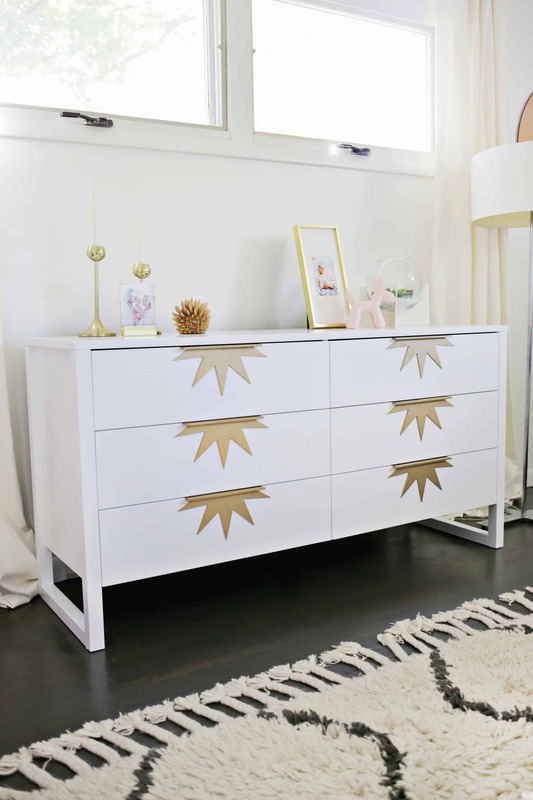 Chalk paint does stick to everything including fabric! I haven’t had any trouble with chips, probably because the paint isn’t so thick of a layer on the finished projects even with multiple costs. For sealing, I recommend Deft Spray Clear Wood Finish in satin. It actually a lacquer that dries in 10 minutes and is as hard as nails. One more tip in case you’re doing kitchen cabinets, be sure to caulk all the seams in any raised panels. Those spots are where moisture can get down behind the paint and cause it to peel. You only need a very thin bread of caulk, so it shouldn’t show at all. In case you’re wondering, I don’t work for My Savvy Sister. Their product is just the best I’ve ever found and so easy to work with. Happy chalk painting! Thank you, Barbara, for this great info! 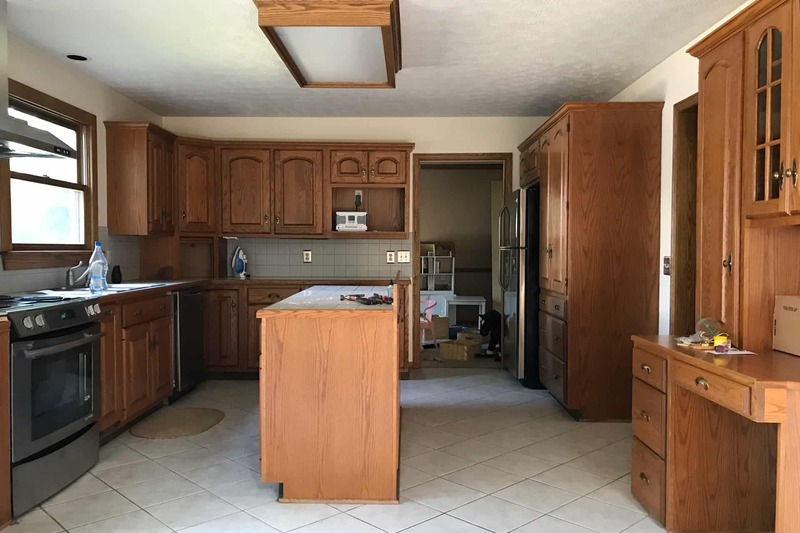 How have your cabinets held up? I’m planning on using chalk paint to paint my cabinets and my laminate counter tops. 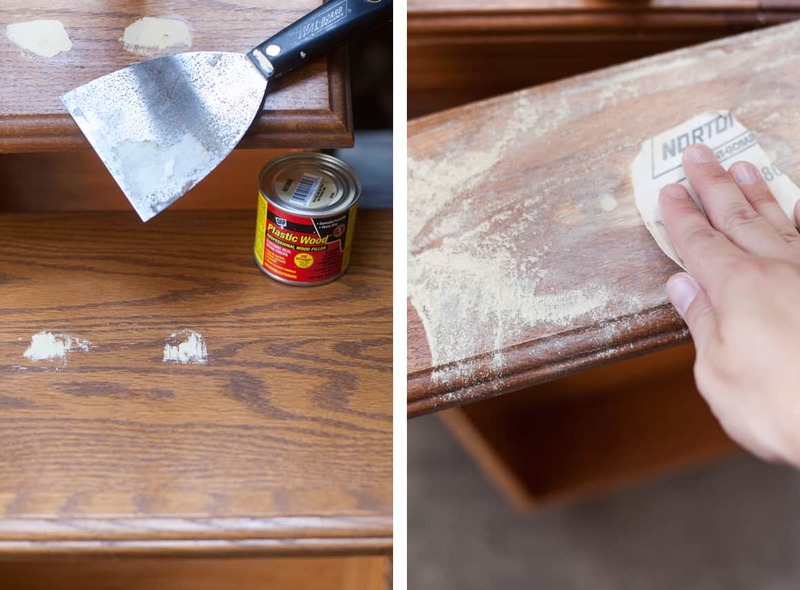 Have you ever used chalk paint on laminate? Thank you for such a well thought out and helpful post! I’m so impressed by how detail-oriented and thorough you are. I used chalk paint to paint some wooden stools recently and I wish I’d known previously that the polyurethane would yellow them slightly, that has definitely happened. Just a few tips from my experience that may help with some of the problems mentioned above. You can mix water with Annie Sloan chalk paint. This helped me tremendously. It makes the paint go on more smoothly and evenly, so less brush strokes. You will have to do more layers, but it helped me so much to obtain a smooth finish. I also painted a thin layer of clear shellac over the wood before painting with the chalk paint. I was painting mahogany with water stains, so I wanted to make sure nothing bled through. I read the shellac tip somewhere else online, and I guess it worked because I had no bleed-through! I certainly should have thinned it! Though I cringe at thinking how long it would take, and how many drips I’d get. 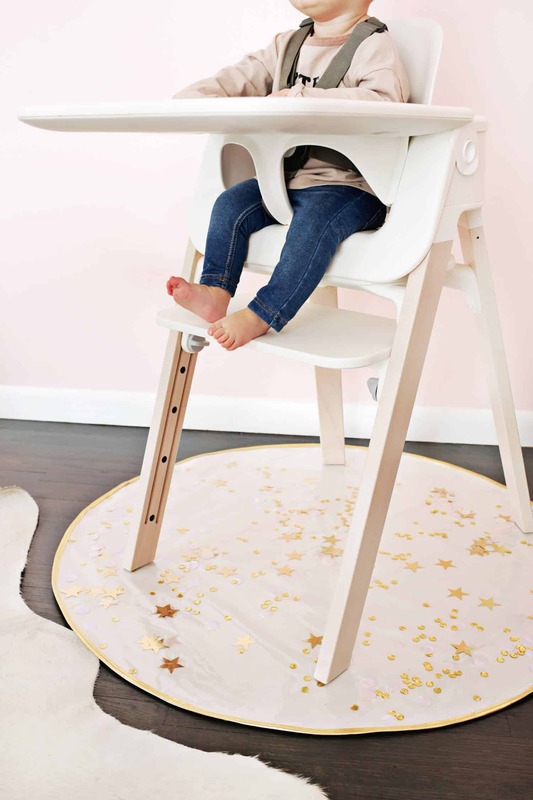 If I could do it over, I would try to spray the chalk paint and roll it onto the base. Maggie is right. 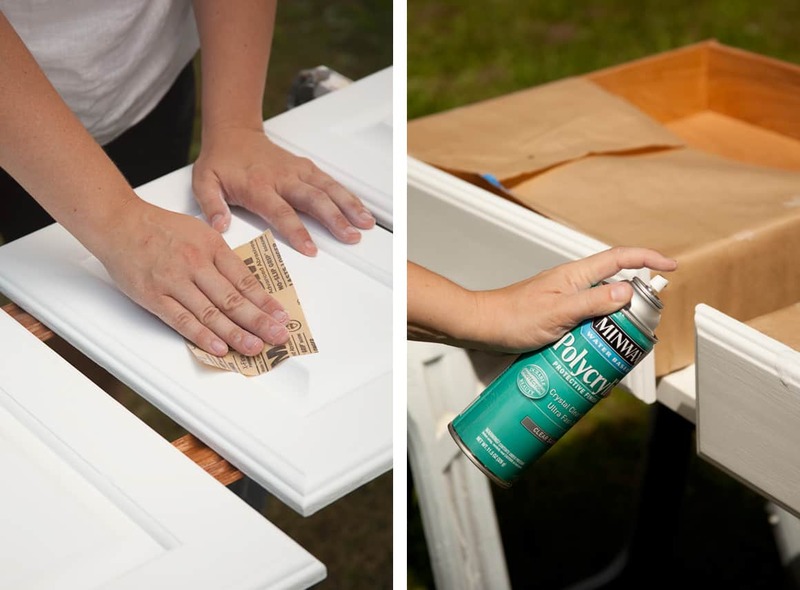 I’ve tried it myself adding a little water in Annie Sloan’s chalk paint while painting a dresser and it worked out really nice – no globs, smooth, even finish just a few more strokes. Nice tip about the water-based sealer though, the other one does indeed turn yellowish! Such an awesome, awesome post! I have never even HEARD of chalk paint! I’m so glad I read this through. And I appreciate the non-yellowing poly, I think I used this to seal my furniture but I had no idea there was a difference! Your kitchen looks so beautiful, and you must be so proud of all that hard work! Stunning transformation! May I ask: how much paint did you need? It inspired me to repaint our kitchen, but I cannot figure out the measurements for the paint. I think I used two cans. They’re small cans, but they go far! I used three small cans (forget what size they are, maybe half pints?) of polycrylic. Question… Can you paint chalk paint for First coat and chalk paint for 2nd coat… Instead of 2 coats of chalk paint? Would that remedy the brush marks? I’m not sure what you mean, could you clarify? Can you wipe the cupboards with a wet rag to clean them? Or will the chalk paint smear? After sealing with the Polycrylic, you can scrub, scrub, scrub with no issues. Thank you so much for this helpful post. 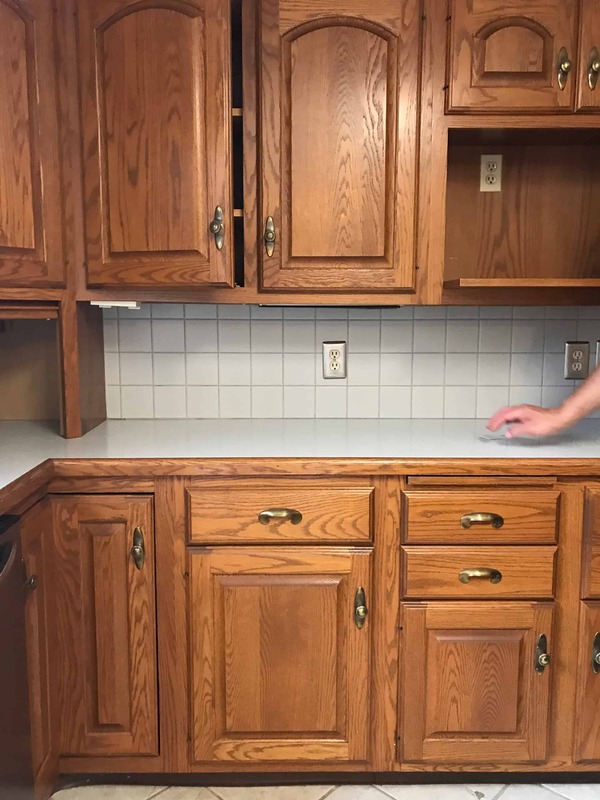 As someone who is about to refinish oak kitchen cabinets, I am just wondering how you feel yours have held up? That is the one thing that makes me nervous about painting them, although Indefinitely would prefer a painted, lighter look to stain. Thanks in advance!!! How do you properly clean kitchen cabinets that are chalk painted and waxed ? Thank you for any help. One of the better posts I’ve found online. Than you. Two questions. How is the chalk painting holding up now that it’s been a few months? Second, how much time would you estimate for each step? I’ve chalk painted a few kitchens and laundry rooms – its a great way too get a few more years before a reno. Enjoyed the post. Hi! Gorgeous! If you haven’t tried General Finishes milk paint I highly recommend! It’s a dream to work with. Sooooo much easier than any chalk paint I’ve tried. I painted my kitchen cabs like a year ago and still haven’t put a top coat on the doors and hardly a blemish to be seen so good durability as well. Your kitchen looks amazing! We are also interested in doing our kitchen. Hope it turns out as nice. we’re wondering how many cans of Anne’s paint you used. I have laminated cabinets. Can these be painted? Hope you get an answer to this as I am in the same boat! There are a lot of factors that you have to take into consideration when choosing between chalk and latex paint. For example, if you want something that dries quickly then you might consider chalk paint. That is why it is so popular for painting or customizing furniture after all. Can you spray on chalk paint or is too thick for that? I live in Madison, WI. Which is a large city but I could find no retailer that sold Annie Slaon chalk paint. I would have to travel 30 miles for the closet retail store and pay a lot of money. Instead, I bought Dutch Boy chalk paint at Menards. I could get any color I want!… Unlike Annie Sloan. It may not be as thick but, that can be a good thing. It lays smooth. I applied both with a synthetic lint free roller and used a large DECK paint brush that cost $9. An awesome alternative to the expensive Annie Sloan brush! After the paint dried, I dry sanded and became frustrated. I learned if I applied water to the surface, using a spray bottle, sanding became so much EASIER, Gently sand with very fine sandpaper. Don’t overdo it! Take your time and you will see what a lovely, smooth finish you can get with very little effort! Sand, just a little until you see chalk in the water and wipe away. It was very satisfying and I actually enjoyed the process with great results! My projects started with a complete bedroom set. Then living room end tables. Now, I’m ready to tackle the kitchen cabinets! Too bad commenters can’t attach their pictures to threads. I have no website. I am thinking of doing my kitchen cabinets with chalk paint. Since they are kitchen cabinets I am worried about chiping . Can chalk paint be touched up if you get a knick or a chip? Hi Mandi! Thanks so much for posting all of this information. I am currently getting ready to refinish my cabinets using chalk paint. They are a finished would (somewhat glossy). Knowing what you know now, would you have prepped them any other way, added sanding and/or priming, or have they held up well? I’m on the fence if I need to do any prep work. I want them to last and not have to worry about peeling and chipping. Would love to know your thoughts. I am looking at painting my kitchen cabinets. In working with a test piece I am finding waxing to be time consuming and an art. I am thinking of using the polycrylic. Did you use gloss for your cabinets? I wasn’t sure if gloss would be too shiny. Your cabinets look beautiful. I want to know if I can do this as a business and do make overs of clients kitchens . would u recommend it as a full time business .